I recently needed to removed the drive from a Western Digital My Book External USB/eSATA drive enclosure. Unfortunately, this wasn’t an obvious process and this excellent article by Scott Cramer didn’t apply to the newer version (1 TB drive) enclosure I have. So here you go, the steps required to disassemble a new-style Western Digital My Book drive enclosure. 1. Locate the two rubber pads on the bottom of the enclosure near the front, curved surface. Remove these two pads. Depress the two tabs below using a small flat-head screwdriver. 1a. With a couple of credit cards, pry the back edge of the casing apart and hold them open with the credit cards. There are some locking mechanisms there that need to be held apart. You can now slide the plastic casings apart. Note that it is easier to lift the round corners of the case and pop it out of the retainers than it is to slide it off due to the very tight fit of the sliding components. 2. Slide the clear plastic LED front panel conduit forward and remove. 5. Slide the circuit board upwards (away from the drive), just like you did for the metal casing. 6. Remove the 4 screws holding the hard drive to the metal carrier. You’ll see that it is a standard 3.5″ desktop SATA drive. Repeat the steps in reverse order to re-assemble the enclosure. In most cases, the circuit board inside the enclosure is the cause of the failure and the drive itself is fine. 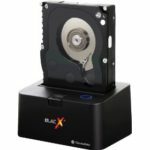 The drive is a standard 3.5-inch SATA drive and easiest way to get your data off is to use a SATA-to-USB adapter dock, such as this Thermaltake Dock at Amazon.com. Use TestDisk to repair damaged partition tables. If you’re a Linux guru and have an empty spare drive on which to copy data, you can try using the SystemRescue bootable Linux CD and Antonio Diaz’s ddrescue command line program. Send the drive a professional data recovery specialist, such as DTI. If you are looking for an even more robust backup solution, I highly recommend using an online backup service. If your hard drive fails, or in case of a catastrophic event (fire, theft), there is still a secure copy of your data. I’ve had great experiences with CrashPlan.com Offsite Backup, which allows you to backup files between your own computers for free, and gives unlimited unlimited offsite storage on their servers for $3.00/Month. In many cases, the enclosure is probably what is failed. But if you’re sure it,s working, you can replace the original drive with a different drive. For example, I replaced the 1TB drive with a 200GB drive. I didn’t have to do anything special, I just put the new drive in the enclosure, plugged everything in, and it worked. (thanks Fisslefink) The onboard chipset memory of the MyBook Studio needed to be reset. When you remove the metal shielding, you see the circuit board and all of the different components. One of them is two metal prongs, an empty jumper (J6, may be different on your board), sticking out of the circuit board, near the DC power input. By shorting those jumper pins together with a metal screwdriver for 2 seconds (with the drive OFF and the power cord REMOVED! ), the board will reset so it can recognize the new drive. For what it’s worth, if your drive supports slower SATA operation, you can use a traditional jumper shunt (those darn little black things that get lost all the time!) to connect the jumpers at OPT1 on the 250GB drive itself. This switches it from the faster “SATA 2” 3.0GB/s transfer rate to the slower 1.5GB/s rate, with which the enclosure chipset may be more compatible. there is an information in the usb but now it need to be formatted so I think the usb is damaged and to access that information or fix the usb if possible. Hi. Just followed your instructions on this and I’ve got my “dead” WD 1TB running in a Next Star Hard Drive Dock. THANK YOU for your guidance on this. on several of the larger NAS or even external desktop drives I have been unable to get any system to recognize the drives once removed from the NAS or USB controller board. These are all larger 3 or 4 TB drives. I had read somewhere that the drives are formatted such as they can only be “seen” when connected to the correct controller. For my correct needs, i would much rather just mount them inside the system case and they do have the standard SATA connectors. Any idea what I am doing wrong? questorfla: You’ll need the exact same controller to be able recover the data from the drive. It’s encrypted by the controller. ACS Data Recovery has been a leading provider of hard drive and RAID data recovery services since 2003. Thank you! Very helpful, I had to open de WD MyBook 500gb. Where do I register to watch the video? I have stumbled upon this guide and first of all thanks for taking time to describe the issues and fixes. I have a MyBook Essential 2TB drive – hdd seams fine, just not mounting. I understand this is a problem with the encryption, however my board (external case – not PCB) looks like it is burned and I am unable to recover it. Do you think that if I buy another MyBook Essential drive with different parameters (ie. 1TB instead of 2TB) – take it apart and use the USB board? Would the encryption key be stored on my drive and work with other USB boards? So far I have used a third party to replace my PCB board (and transfer bios) but it looks like this might have not been the issue. So now I am looking at this burned USB/Power/Board knowing I can’t clean it as it must have effected a lot of components or the whole circuit. Any further explanation or information on this that you might have and could help me, would be grately appriciated. I am unable to afford proper data recovery as it costs too much for me to handle. Data on my drive is uber important for me as it includes photos/videos of my newborn child and it would be a great shame to loose it all (+last 10 years of digital photos and other data). Mike, your best bet is to get a working version of the exact same model, from ebay or elsewhere, and put your drive in that enclosure. Some WD will be the same as yours, but others will be different. I don’t know the details of each model. Your other option is to send the drive to a data recovery service. Good luck! I would like change inner disk in my WD My Book Studio WDBC3G0020HAL. When I opened my WDBC3G0020HAL, I discovered WD20EARX Green’s series. Can I upgrade inner disk with WD Green WD40EZRX or WD50EZRX, WD60EZRX? You might be able to do that upgrade. It’s hard to say. It’s hit or miss with WD compatibility. You can give it a try, but you’re probably better off just getting a new external enclosure and drive. Or find a third-party enclosure and add whatever drive you want. Not sure if you (or Fisslefink) have this documented, a picture references maybe? That newer version may not have a jumper. I didn’t find that it was essential to use it in older versions. No neede reset or anything, only put new drive – format.